What is one of the best part of camping? Making S'mores by the campfire of course! But when the weather is poor or it's too cold outside, no one wants to try to make s'mores outdoors. The weather isn't a factor with S'mores, the game. The game is simple to follow. The first player to build an edible s'more is the winner. To create a s'more you must have all four ingredient cards. The various ingredient cards have different values. A higher quality s'more is worth more points. When a player has collected all four ingredient cards, he must yell S'more! This game is enjoyable for a group of four or six. I could see kids playing this game around a campfire or other outdoor activity. While there isn't a lot of reading involved, I would recommend it to school aged children because they could more easily follow the concept. S'mores the game is from Education Outdoors. There concept is to bring families together through games based on outdoor themes. 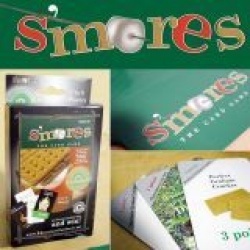 The S’more card game includes 70, 3 x 5” sturdy playing cards , and retails for $5.99. For more information on this game or other Education Outdoor games, please see their website, twitter or Facebook page. Would you like to add S'mores the game to your collection? Please use the Rafflecopter to enter? In the backyard fire pit. I can't wait until summer! On the fire on a warm summer eve! The traditional way over a campfire! At the stove lol it's the only way I've ever done it. in the backyard over our firepit! We like to add peanut butter to ours! I like to make them over a campfire. My marshmallow has to be burnt and gooey. I make them with 2 pieces of graham cracker with 1 marshmallow and one square of chocolate melted in the microwave. Over a fire while camping! My favorite way to make a S'more lots of chocolate and marshmallow over my backyard fire pit during summer.